Israeli soldiers abducted, earlier Sunday, a young Palestinian man, searched homes and closed a main road, in Hebron governorate in the southern part of the occupied West Bank. Media sources in Hebron said several army jeeps invaded Tarqoumia town, west of the city, and abducted Fahd Nader Tannina, 23, after breaking into his home and searching it. The sources added that the soldiers also invaded and searched homes in Doura town, south of Hebron, including the home of a former political prisoner, identified as Hashem Tayyim Rajoub. In addition, the soldiers closed roads at the entrances of the al-Fawwar refugee camp and the ath-Thaheriyya town, south of Hebron, before stopping and searching dozens of cars, and interrogated many Palestinians while inspecting their ID cards. Also at dawn, the soldiers abducted two young men during extensive and violent searches of homes in Qalqilia governorate, in the northern part of the occupied West Bank. 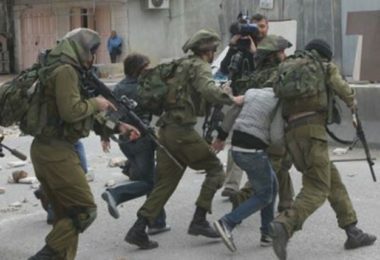 The soldiers also abducted three young men, including a former political prisoner, in Qalqilia governorate, in northern West Bank, and summoned for interrogation three others, including two children, from Bethlehem governorate.